It is 1861, and Albertian Britain is in the grip of conflicting forces. Engineers transform the landscape with bigger, faster, noisier and dirtier technological wonders; Eugenicists develop specialist animals to provide unpaid labour; Libertines oppose restrictive and unjust laws and flood the country with propaganda demanding a society based on beauty and creativity; while The Rakes push the boundaries of human behaviour to the limits with magic, sexuality, drugs and anarchy. Returning from his failed expedition to find the source of the Nile, explorer, linguist, scholar and swordsman Sir Richard Francis Burton finds himself sucked into the perilous depths of this moral and ethical vacuum when the Prime Minister, Lord Palmerston, employs him as 'King's Spy'.� His first mission: to investigate the sexual assaults committed by a weird apparition known as Spring Heeled Jack; to find out why chimney sweeps are being kidnapped by half-man, half-dog creatures; and to discover the whereabouts of his badly injured former friend, John Hanning Speke. 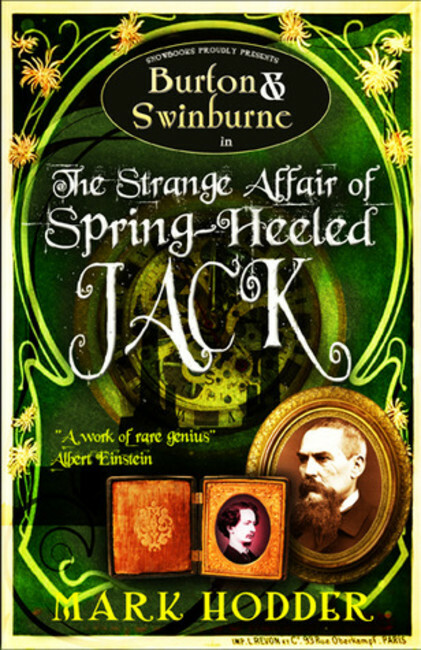 Accompanied by the diminutive and pain-loving poet, Algernon Swinburne, Burton's investigations lead him back to one of the defining events of the age: the brutal assassination of Queen Victoria in 1840; and the terrifying possibility that the world he inhabits shouldn't exist at all.